Why, hello. 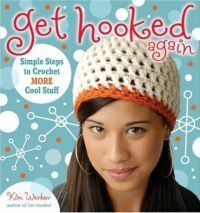 This is Kim, author of Get Hooked and Get Hooked Again. I’ve just learned that both books are now, sadly, officially out of print. I know it can be very hard to find a copy in stores, but I do believe many libraries – especially libraries with strong programming for tweens and teens – carry them. Thank you so much for your enthusiasm for these books! They were exceptionally fun to write, and I hope they continue to inspire you to be crafty. If you’d like to keep up with the stuff I’m currently working on, I hope you’ll come say hello over at my main website. 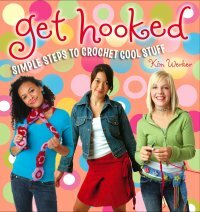 Get Hooked and Get Hooked Again are books for tweens, teens, and grown-ups who want to have a blast with the craft of crochet. Featuring thorough, photo-illustrated tutorials to get you started crocheting, the books are perfect for beginners of all ages. Cool patterns are fun to make, and the tutorials walk you through the basic stitches and more advanced techniques. 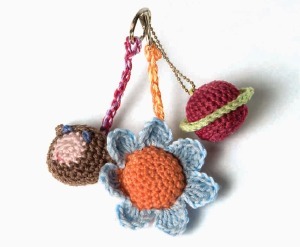 Plus, there are all sorts of tips and ideas to make your crochet adventure even more fun. Author Kim P. Werker is the editor of Interweave Crochet magazine and the founder of CrochetMe.com, a leading force in the crochet revolution. She is the author or co-author of five books, including Crochet Me: Designs to Fuel the Crochet Revolution, Teach Yourself Visually Crocheting, and Crochet Visual Quick Tips. She lives in Vancouver, Canada, with her husband and their dog, and she writes and maintains this web site. Illustrator Cynthia Frenette is a freelance illustrator and designer who lives in Vancouver, Canada, with her husband and two cats. 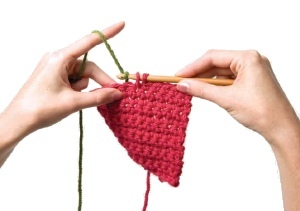 An avid crafter and artist, she loves to crochet! Photographers Pamela Bethel (tutorials and notions) and Angela Fama (models) are also Vancouver-based.